Citation PHYLA FRUTICOSA (Miller) K. Kennedy ex Wunderlin & B. F. Hansen, Bot. Explor. (Florida) 3: 38. 2003. Basionym: Verbena fruticosa Miller 1768. Type: MEXICO: Campeche: Without data, Houston s.n. (lectotype: BM). Lectotypified by Moldenke, in Woodson & Schery, Ann. Missouri Bot. Gard. 60: 62. 1973. Lippia fruticosa Lippia fruticosa (Miller) R. W. Sanders, Harvard Pap. Bot. 5: 347. 2001. BASIONYM: Verbena fruticosa Miller 1768. Lippia nodiflora forma sericea Lippia nodiflora (Linnaeus) Michaux, forma sericea Kuntze, Revis. Gen. Pl. 2: 508. 1891. TYPE: TRINIDAD: Without locality, 4 Apr 1874, Kuntze 714 (holotype: NY). Lippia nodiflora var. reptans Lippia nodiflora (Linnaeus) Michaux, var. reptans (Kunth) Kuntze, Revis. Gen. Pl. 2: 508. 1891. BASIONYM: Lippia reptans Kunth 1818. Lippia nodiflora var. strigulosa Lippia nodiflora (Linnaeus) Michaux, var. strigulosa (M. Martens & Galeotti) J. F. Macbride, Field Mus. Nat. Hist., Bot. Ser. 13(5): 651. 1960. BASIONYM: Lippia strigulosa M. Martens & Galeotti 1844. Lippia reptans Lippia reptans Kunth, in Humboldt et al., Nov. Gen. Sp. 2: 263. 1818. TYPE: VENEZUELA: Sucre: Cumana, Jul-Nov 1799, Humboldt & Bonpland 76 (holotype: P; isotype: B-W). Lippia strigulosa Lippia strigulosa M. Martens & Galeotti, Bull. Acad. Roy. Sci. Bruxelles 11(2): 319. 1844. TYPE: MEXICO: Veracruz: La Antigua, Jun 1840, Galeotti 748 (lectotype: BR). 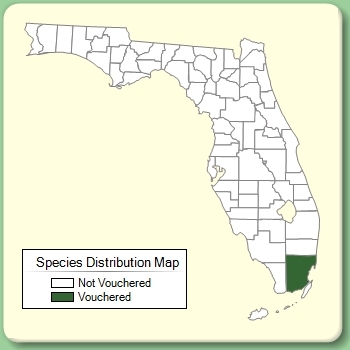 Lectotypified by D. L. Nash & M. Nee, in Gómez-Pompa, Fl. Veracruz 41: 95. 1984. Phyla nodiflora var. 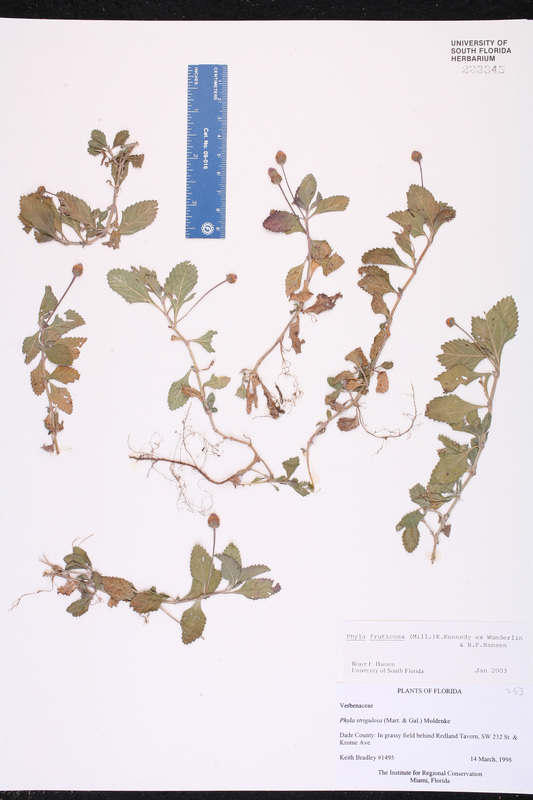 reptans Phyla nodiflora (Linnaeus) Greene, var. reptans (Kunth) Moldenke, Torreya 34: 9. 1934. BASIONYM: Lippia reptans Kunth 1818. Phyla nodiflora var. sericea Phyla nodiflora (Linnaeus) Michaux, var. 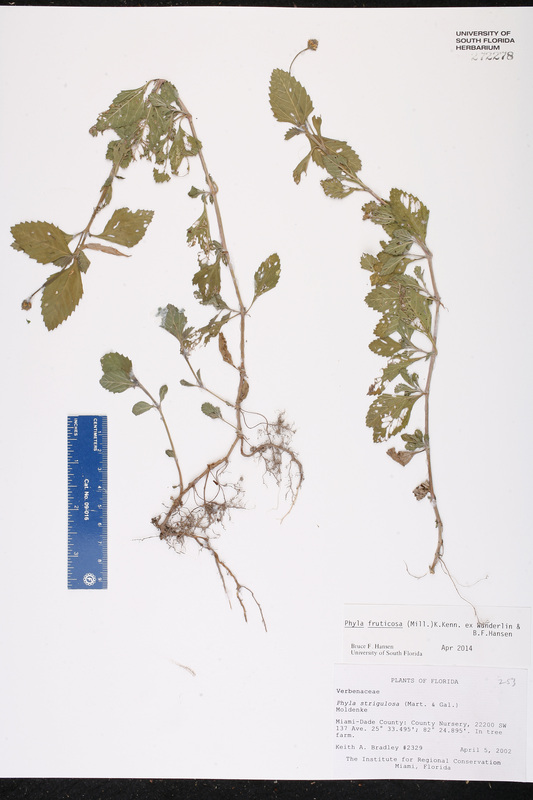 sericea (Kuntze) Moldenke, Phytologia 1: 98. 1934. BASIONYM: Lippia nodiflora (Linnaeus) Michaux, forma sericea Kuntze 1891. Phyla reptans Phyla reptans (Kunth) Greene, Pittonia 4: 47. 1899. BASIONYM: Lippia reptans Kunth 1818. Phyla strigulosa Phyla strigulosa (M. Martens & Galeotti) Moldenke, Phytologia 2: 233. 1947. BASIONYM: Lippia strigulosa M. Martens & Galeotti 1844. Phyla strigulosa var. sericea Phyla strigulosa (M. Martens & Galeotti) Moldenke, var. sericea (Kuntze) Moldenke, Phytologia 19: 435. 1970. BASIONYM: Lippia nodiflora (Linnaeus) Michaux, forma sericea Kuntze 1891. Verbena fruticosa Verbena fruticosa Miller, Gard. Dict., ed. 8. 1768. TYPE: MEXICO: Without data, Houston s.n. (lectotype: BM). Lectotypified by Moldenke, in Woodson & Schery, Ann. Missouri Bot. Gard. 60: 62. 1973. Lippia queretarensis Lippia queretarensis Kunth, in Humboldt et al., Nov. Gen. Sp. 2: 263. 1818. TYPE: MEXICO: Querétaro: Without data, Bonpland s.n. [4196?] (holotype: P). Phyla strigulosa var. parvifolia Phyla strigulosa (M. Martens & Galeotti) Moldenke, var. 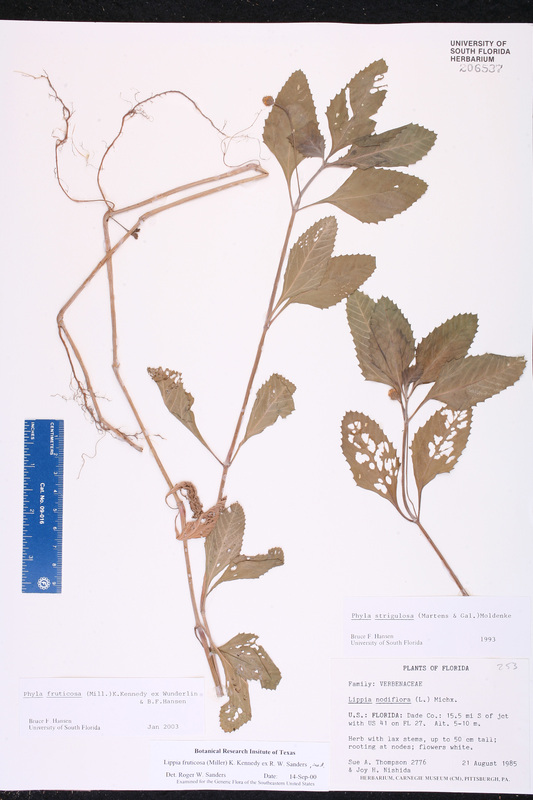 parvifolia (Moldenke) Moldenke, Phytologia 2: 233. 1947. BASIONYM: Phyla yucatana Moldenke, var. parvifolia Moldenke 1946. Phyla yucatana Phyla yucatana Moldenke, Phytologia 2: 140. 1946. TYPE: BELIZE: Corozal: "Along Corozal-Pachacan road", 20 Jul 1933, Lundell [Gentle] 4780 (holotype: NY; isotypes: CAS, NY, TEX 3 shts). Phyla yucatana var. parvifolia Phyla yucatana Moldenke, var. 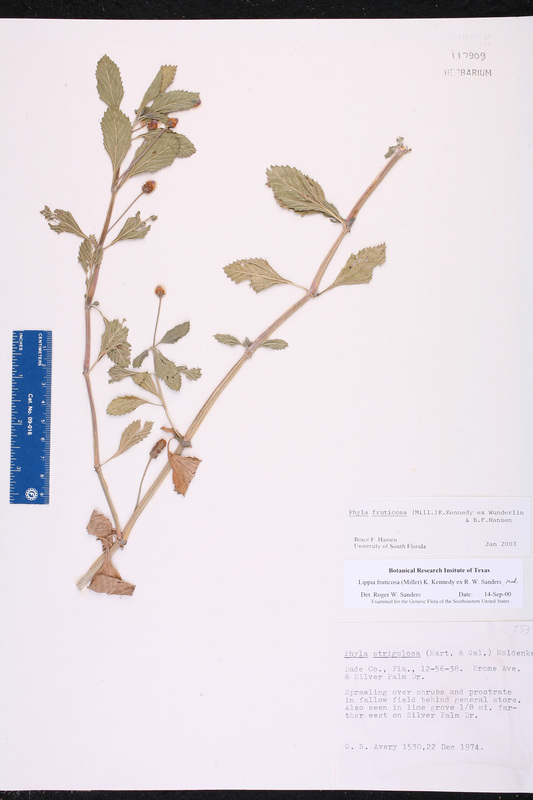 parvifolia Moldenke, Phytologia 2: 141. 1946. TYPE: MEXICO: Michoacán: Mal Paso, Huetamo Distr., 9 May 1934, Hinton 6024 (holotype: NY; isotype: US).